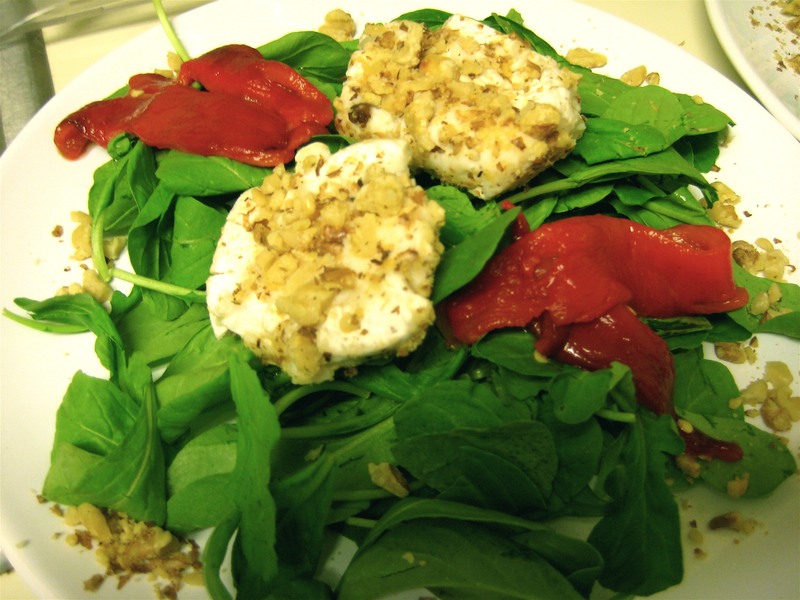 Walnut Goat Cheese Salad with Roasted Red Peppers – Voila! Recently James and I have been thinking about being vegetarian. Not that we’re going to stop eating meat right away, but we’re beginning to learn and understand the benefits — both personally and environmentally — of eating less meat. The goal isn’t necessarily to become a vegetarian, just be more aware of what we eat and how it affects the world around us (a bit grandiose, but hey we can hope, right?). So in our first plan of action, we’ve decided to make at least one vegetarian meal a week (an idea that came to me by way of Kim O’Donnel’s A Mighty Appetite). Tuesday night was our inauguration vegetarian night with a mushroom and leek tart and the roasted red pepper and goat cheese salad. The salad is a mix of Martha Stewart and my own red pepper additions. 1. Wash and dry red peppers before putting them on cookie sheet. Place cookie sheet in oven and rotate peppers every 20 minutes so entire pepper gets roasted. Takes about an hour. Once the skin has black, roasted splotches and looks like a very inflated balloon, remove and set aside to cool. 3. Place walnuts in sandwich-sized ziploc bag. Using a bottle or hammer or other hard object, crush walnuts into chunky crumbs. 6. Once walnuts are completely cool, roll goat cheese in walnuts until covered. 7. Arrange arugula on plate, add goat cheese and pepper slices. Sprinkle rim of plate with remaining walnut pieces. 8. For a quick, easy and light salad dressing mix red wine vinegar, orange juice, olive oil, salt and pepper in small bowl and whisk. And voila! Our first once-a-week-vegetarian-meal! 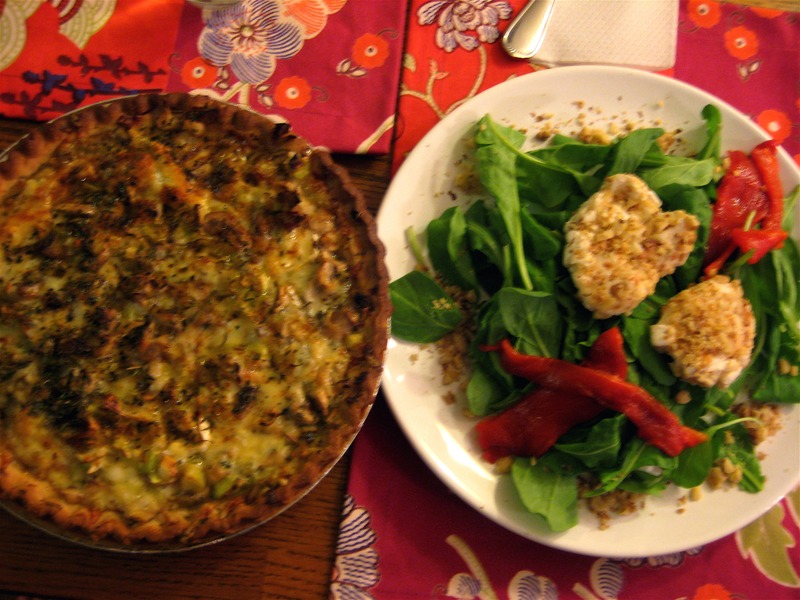 Post-baking thoughts: The leek mushroom tart recipe is the same as the tomato gruyere camembert tart. But instead of tomatoes, I sauteed one leek and one 8 oz. carton of mushrooms. After making a variety of tarts I would say that they’re too cheesy! Here’s how I would layer it next time: camembert, leeks/mushrooms, spices, gruyere, leeks/mushrooms, spices and a small final sprinkling of gruyere. In past recipes there was an extra layer of camembert and gruyere after the second layer of veggies and it’s just too much! I love being a vegetarian. I recommend Laurel’s Kitchen–it is hands-down my favorite vegetarian/whole foods cookbook. Best of all, she doesn’t rely on “fake” meat products which, I think, is essential to move beyond if you are planning on being a long-term vegetarian. Her cookbook also includes a lengthy section on homemade bread and on proper vegetarian nutrition–without a bunch nonsense that I think other vegetarian cookbooks rely on. Too much cheese! The thought seems impossible. But that looks delish. I especially like the salad. See you Sunday! And Kate! I’m excited about Sunday! not sure what I’m making yet…maybe this tart and then you can be the judge of how cheesy it is 🙂 See you then! Pingback: Food for Thought: City Wide Veggie Day « Voila! Pingback: Valentine’s Day Ideas « Voila! Pingback: Oven Baked Veggie Samosas « Voila!